Are There Blu-ray Disc Recorders? The Blu-ray format provides consumers access to high definition quality video (and audio) in a disc-based format that enhances the home theater experience. However, when Blu-ray technology was developed, it was stated that in addition to playback, that it would include recording. While Blu-ray supports high definition video recording, and Blu-ray Disc recorders are marketed and sold in Japan, and other select markets, there are no plans to market stand-alone Blu-ray Disc recorders in the U.S market for consumers. Why There Are No Consumer Blu-ray Recorders In The U.S. The are two main reasons why there are no consumer Blu-ray Disc recorders in the U.S.
One reason is a business decision that involves the wide popularity of TIVO and Cable/Satellite DVRs in the U.S., along with conveniences, such as internet streaming, which manufacturers feel would affect the competitive success of Blu-ray Disc recorders. The second reason is far more sinister: copy-protection. U.S. TV broadcasters, Cable/Satellite providers, and movie studios have always been paranoid (with some justification) about video piracy. Allowing consumers to record high-definition content onto a physical disc would make it easier to make unauthorized permanent copies that look very close to the original source, which could be passed around or sold. This has the potential to decrease sales of the same content on commercial Blu-ray Disc or reduce cable/satellite subscriptions. Despite availability and disc recording limitations, broadcasters and movie studios have thrown consumers a bone by allowing the recording of high-definition content on cable/satellite, and over-the-air DVRs. This solves the problem of permanent storage, because as a DVR hard drive fills up, some, or all, recordings need to be deleted in order to make space for new recordings. Unfortunately, consumers cannot make high definition copies of that stored content onto a DVD or Blu-ray disc due to a special layer of copy-protection that allows the content to be recorded on the DVR but not copied to a disc format. The powers-that-be have even restricted the ability of consumers to record their content onto DVD, which isn't a high definition format. There is increased use of embedding copy-protection signals in cable/satellite, and even some broadcast TV programming that prevents recording to disc-based formats, such as DVD or Blu-ray. The only exception in the U.S. market is a line "prosumer" Blu-ray Disc recorders introduced and manufactured by JVC, and another one offered by Teac's professional division: TASCAM. However, these units do not have RF connections paired with onboard HD TV tuners and do not have component (red, green, blue) or HDMI inputs for recording high definition TV, cable, or satellite content. If you desire to record high definition video on a disc, with some limitations, you can buy Blu-ray Disc Writers that install on a PC or purchase a PC or Laptop with Blu-ray recording capability built-in. JVC SR-HD2700US. This Blu-ray Disc recorder does feature an HDMI input. However, it cannot be used to record from HD Cable/Satellite boxes or Blu-ray Disc players due to the presence of HDCP copy-protection. The HDMI input can only be used to record from non-copy-protected sources, such as portable or studio HD camcorders or video cameras. BD-R: A record-once only format disc, similar in concept as a DVD-R, DVD+R, or CD-R disc. BD-RE: A re-writable format disc that can be erased, edited, and re-used multiple times, similar in concept to DVD-RW, DVD+RW, DVD-RAM, or CD-RW disc. Most, if not all, Blu-ray recorders released so far also record in one or more of the current standard DVD recording formats, such as DVD-R/-RW or DVD+R/+RW. Blu-ray discs you make yourself can only be played on a Blu-ray Disc player or recorder. If you copy a VHS tape onto a Blu-ray disc, the recording result will still look like VHS. A Blu-ray Disc recorder will not magically make everything Blu-ray Disc quality. The same goes for copies of DVDs, the result will still look like DVD. The same copy protection rules for DVD recorders apply to Blu-ray disc recorders. You can only make copies of home-recorded VHS tapes and DVDs. You cannot make copies of most commercial VHS tapes or DVD movies. 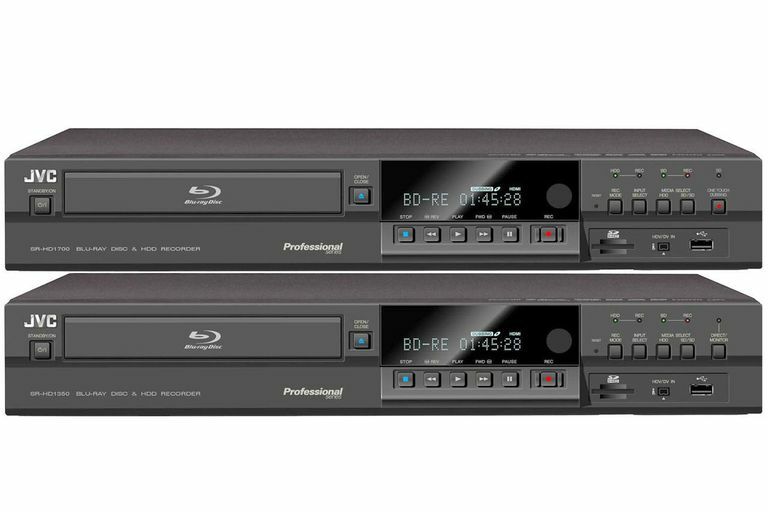 Information about further availability and capabilities of Blu-ray Disc recorders will be added to this page as it becomes available.